Carlina and Alejandro had a stylish, funky little ceremony under a giant (fake) bull's head at Toro in Boston's South End. After the ceremony, Margaret and Max of Unusually Fine Photography abducted the pair for a quick shoot in a small park nearby. Carlina couldn't be any cuter: that dress from BCBG is ridiculously adorable. And check out the confetti. Oh, and the food. Alejandro is, after all, a pastry chef in Singapore. . . . Unusually Fine is a boutique photography studio operating out of New York City. Max and Margaret accept a select number of commissions each season, allowing them to provide each client exclusive attention and unparalleled images. They are passionate about photography. Their work combines a modern sensibility with old school quality. The resulting images are fresh classics. 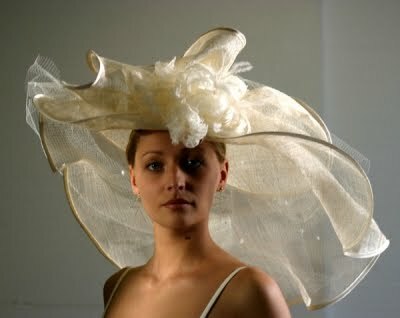 Enjoy this alluring hat and head piece combo from Catherine Alhinc fashioned out of lightweight buckram. 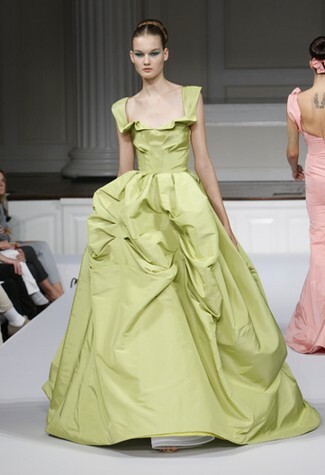 Tip: The gown you pair up with this one needs simplicity and great lines . 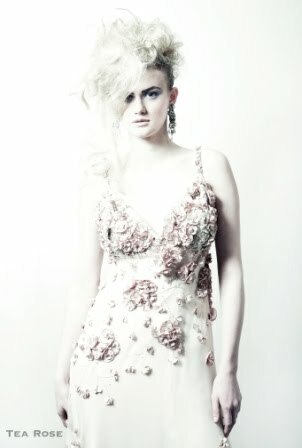 . .
Say hello to the new English Rose. 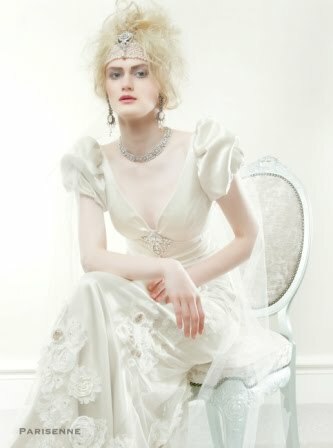 Drawing from the inspiration of THE waif/Goth/fairy-tale, designer Sharon Bowen's new English Romantic Collection pieces are stunning, perfect for the bride wanting that storybook quality mixed with cutting edge. I'd call each one of these looks inspiring for the roguish brides out there . . . 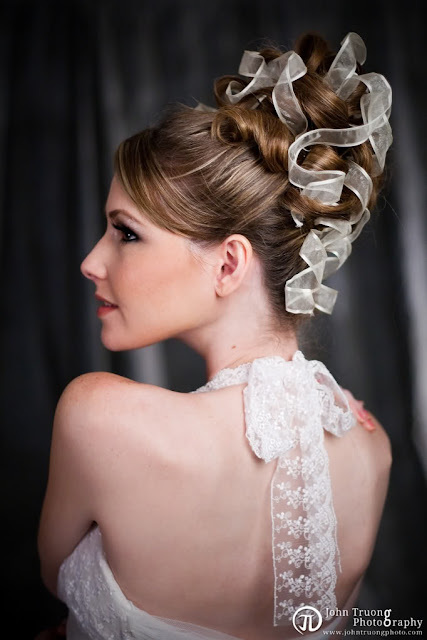 There's a focus on inventive hairdressing lately whether you decide to ditch the veil or not. 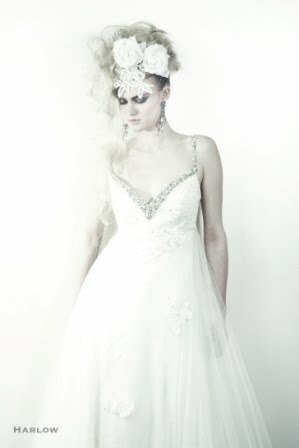 Once you've chosen your gown, your head is the next most crucial detail to dressing the part. 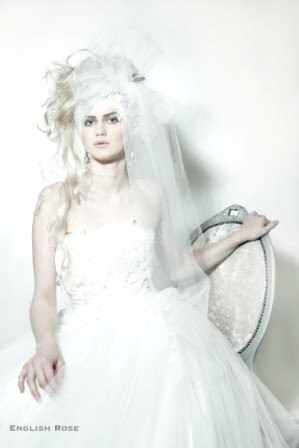 Because not every bride feels right doing the veil thing, some are opting for smaller headpieces, even hats. For those of you wanting to skip the cake top template of hairstyles all together and try something innovative, we look to hairdresser Kathie Rothkop of Salon Glam in Novato, California. 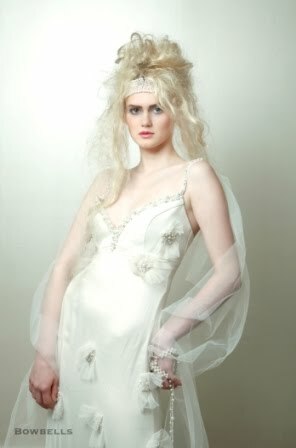 Creating hair art for years, I asked her about her take on bridal hair. 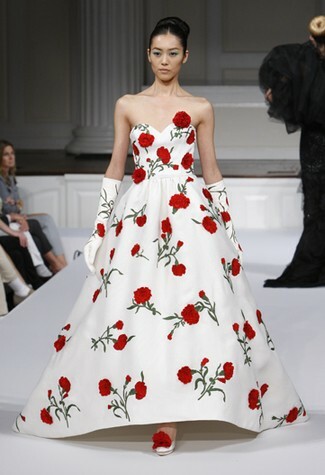 Here's what she said: "I get inspired first by the style of the gown, second, the type of woman wearing the gown and the time of year of the wedding. "I put women in 4 categories. Sporty, classic,romantic and edgy. A sporty woman would want hair very simple, probably short and tailored. Her gown would be clean-lined. Classic would be very traditional, maybe a french twist, no ornamentation. Grace Kelly was a classic beauty. Romantic is my favorite. Lots of bling, flowers, height, softness and curls. Goldie Hawn and Catherine Zeta Jones are good examples of this. Edgy is non traditional, Lady GaGa really is this look." The above image of a long braid dappled in Stephanotis was inspired by the braid with hyacinths Elizabeth Taylor wore when she married Richard Burton in 1964. 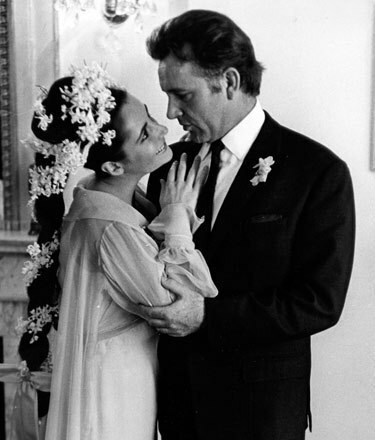 Out of the pages of 1960s Vogue, this wired, white ribbon weaves in and out of Lauren's bun forming ringlets. 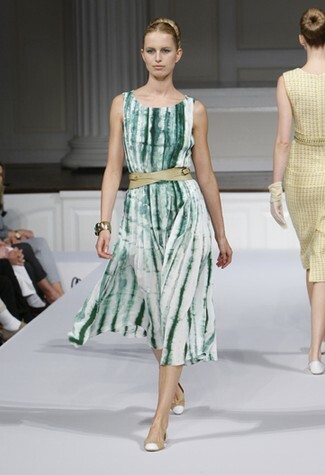 A great match for most any gown--even short and mini styles. Go wild with Spring flowers in bloom. 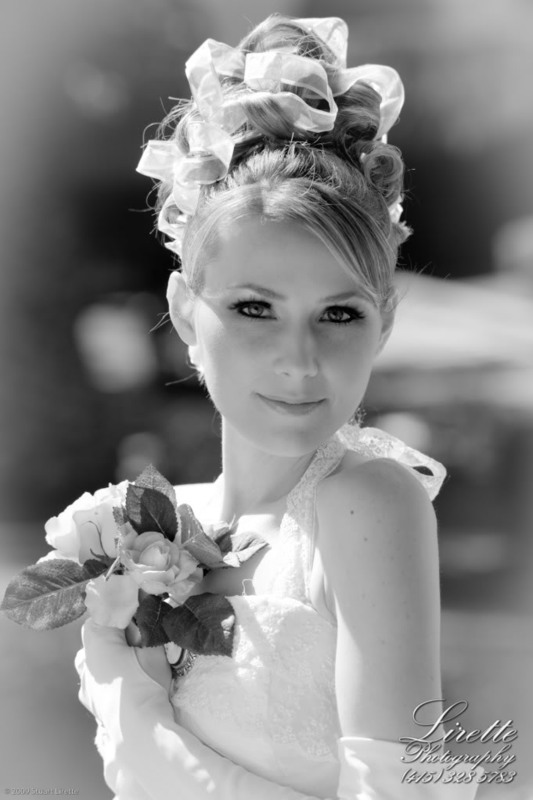 This loose upsweep accented with fresh Star Royal Magnolias would be the perfect compliment of any destination wedding. Birds of a feather . . . . Dare to go avian with the whole bird, including feathers. 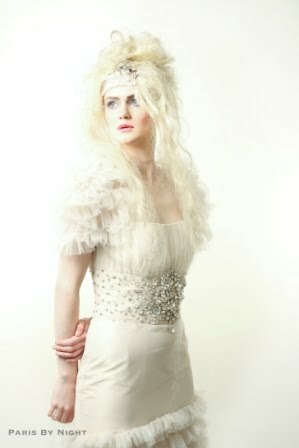 The hair is long and loose with tiny braids interwoven at the crown . . .Stunning with sheath and evening gown styles. Got long locks? Flaunt it all with half up and half down hair. 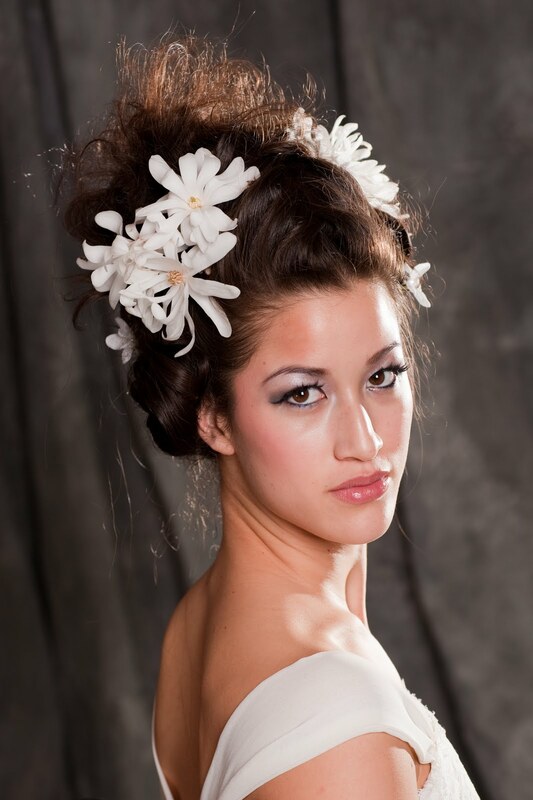 The bun is sprinkled with white Stephanotis. Muted beiges, reds and browns, this beautiful medley is a preview of coming attractions, reminding us, Fall is really here. A big thanks once more to the very talented Shana over at SMP Style Circle. for putting these images together. Want more inspiration like this? Check out her blog, Baubles and Bubbles . . . Colors and natural backdrops outlined in black make powerful statements. Today we're looking at fusions of landscape, food and fashion surrounded by black and dark shades . Thank you Renee Ferguson of SMP Style Circle for posting this gemmie of a board. Check out her blog, The Beginning of Forever for another dose of pure inspiration . . .
Spring collections are my favs. All those bloomin' colors and lightweight, wispy fabrics. 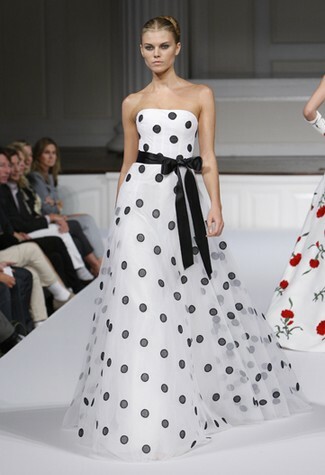 Oscar de la Renta has always had a knack for bringing on the Spring gala chic. He definitely has my compliments this season . . .